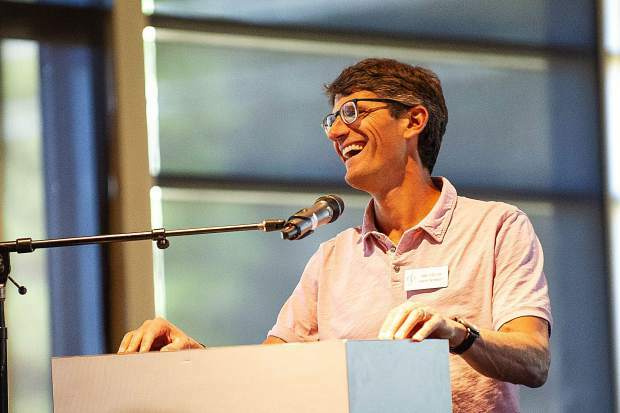 Aspen Skiing Co. President and CEO Mike Kaplan discusses Friday how the Lost Forest summer activity center creates potential for business growth. 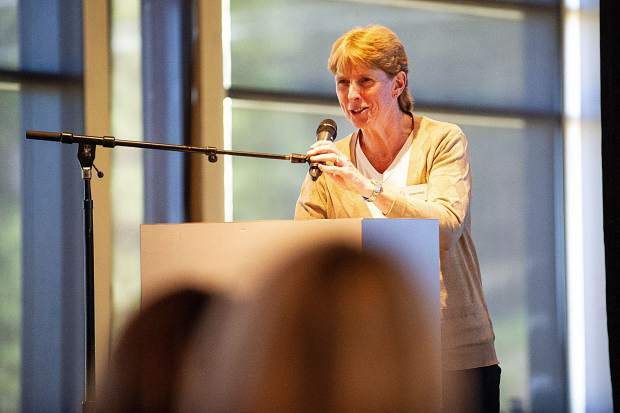 Susan Cross, who will take over as general manager at Snowmass Ski Area at the end of the year, addresses the crowd Friday at the Upload for the Download event at Snowmass Ski Area. 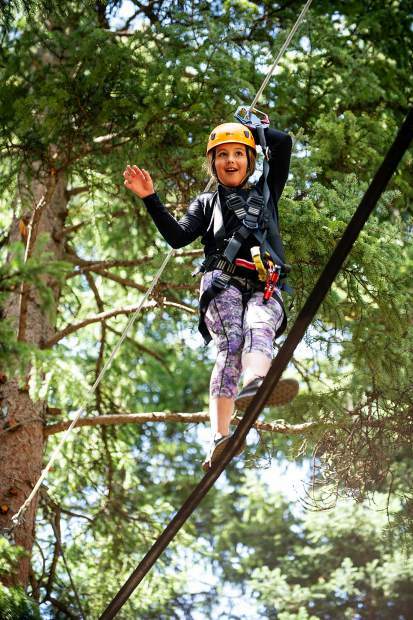 Chloe McGann, 12, crosses a tight rope in the Lost Forest Treeline Challenge course on Aug. 17 in Snowmass. Snowmass Ski Area General Manager Steve Sewell addresses the crowd Friday at the Upload for the Download event at Snowmass Ski Area. Felix, 9, crosses a log bridge on the treeline challenge course in Snowmass for opening day earlier this summer. Caroline Goulandris, 10, on the ropes course treeline challenge on the opening day of the Lost Forest in Snowmass earlier this summer. 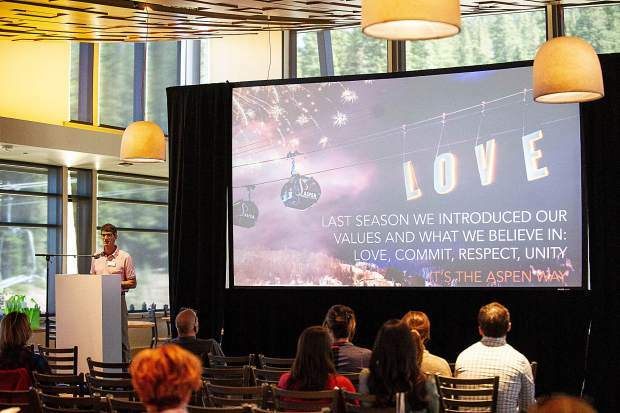 Aspen Skiing Co. President and CEO Mike Kaplan discusses the firm's social actvisim advertising campaign Friday at an event in Snowmass. 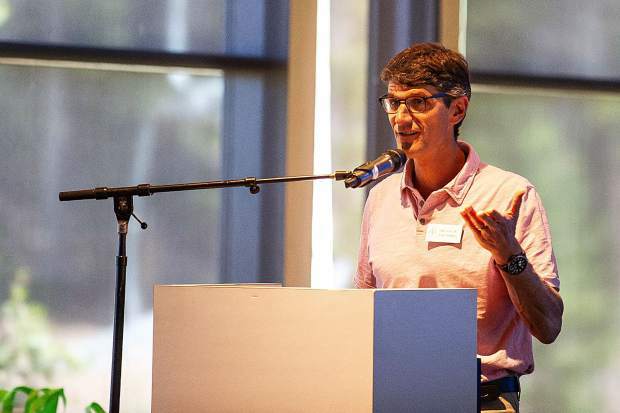 Aspen Skiing Co. President and CEO Mike Kaplan talks about the potential for summer business growth Friday at the Upload for the Download event at Snowmass Ski Area. 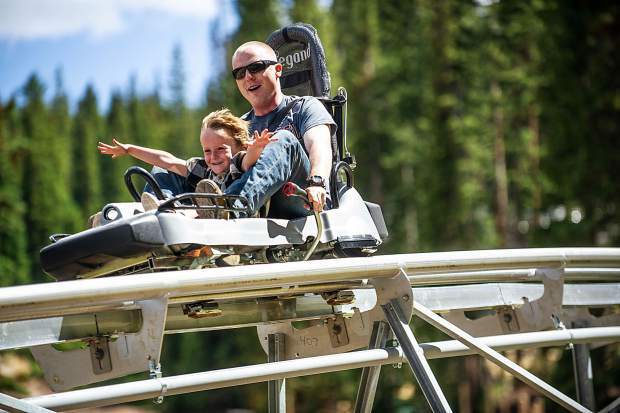 A pair enjoy the Breathtaker alpine coaster in Snowmass earlier this summer. 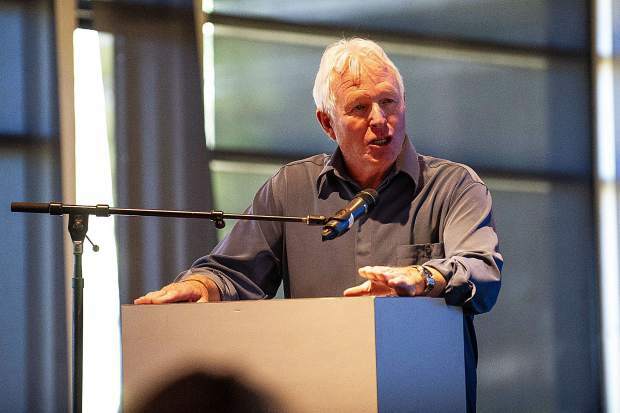 Despite the Aspen Skiing Co.’s name, it is summer rather than winter that holds the greatest promise for future growth, president and CEO Mike Kaplan told an audience Friday in Snowmass Village. 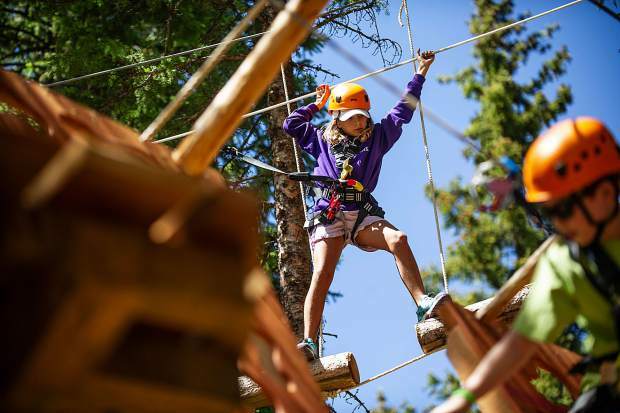 Skico invested $10 million in the Lost Forest summer adventure playground that opened this summer in the Elk Camp section of Snowmass Ski Area. 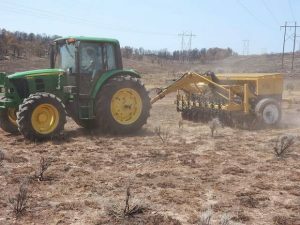 The company is betting that it can grow its business in July and August to rival prime winter months. 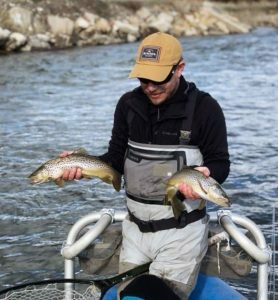 Skico increased its ridership on the Elk Camp Gondola by about 50 percent this summer, Kaplan told a couple hundred people attending a free community event called Upload for the Download. 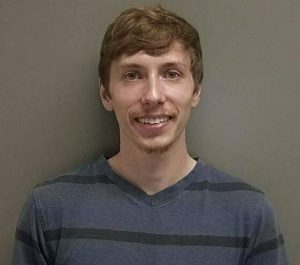 “We’re not there yet,” he said about developing the summer business. Despite the growth at Snowmass, it was still only about half of the passengers Aspen Mountain’s Silver Queen Gondola hauls during summer. Occupancy and sales tax revenue for Snowmass Village were up throughout the summer months, sometimes drastically up. That’s not due entirely to the Lost Forest, Kaplan said, but that plays a big part of it. The Lost Forest features the Breathtaker Coaster that sends riders on bobsled-like cars around a 5,700-foot track and plummets 410 vertical feet. The coaster winds through the trees between a couple of Elk Camp’s ski runs. There’s the Canopy Run Ziptour, a guided tour on eight zip lines and two sky bridges that span trees and platforms in the forest. 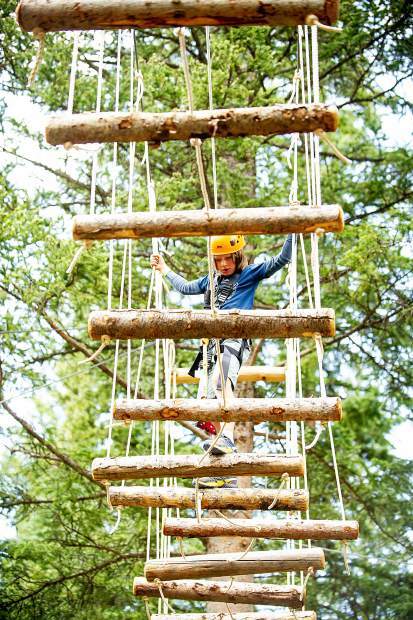 The Treeline Trail Challenge Course provides opportunities to cross five different paths on high ropes. The Rugged Ascent Climbing Wall presents numerous routes within its 40 feet tall and 60 feet wide confines. Skico also added to its downhill cycling and hiking trail network as part of the Lost Forest construction. The Lost Forest and completion of Snowmass Base Village are supposed to finally mold the resort into the moneymaker Skico has always hoped it would be. While Aspen Mountain is the flagship resort, Aspen Highlands is the locals’ favorite and Buttermilk is home of Winter X Games, Snowmass is where Skico generates the majority of its roughly 1.5 million skier visits each winter. And Snowmass is where Kaplan and crew see the greatest potential for summer growth. “The other intention here was to generate year-round economic viability,” Kaplan said of completing Base Village and adding the Lost Forest. Base Village’s evolution will take a big step forward in December when Skico’s Limelight Hotel, with 99 hotels rooms and 11 residences, opens. It will feature the same type of lounge that makes the Aspen Limelight so popular as well as a four-story climbing wall. Despite goals and intents, summer has a long way to catch winter business.